By John Turner. All photos by Tom Pfeifer. The common woodpecker of suburban Long Island. It is the smallest woodpecker (the size of a house sparrow), is widespread on Long Island, and often visits backyard bird feeders during the colder months. It does well in Long Island’s heavily developed communities since, in addition to larger tracts, it can successfully inhabit small woodland fragments of just a couple of acres in size. A common woodpecker species on Long Island, but less abundant than its look-a-like cousin, the Downy Woodpecker. 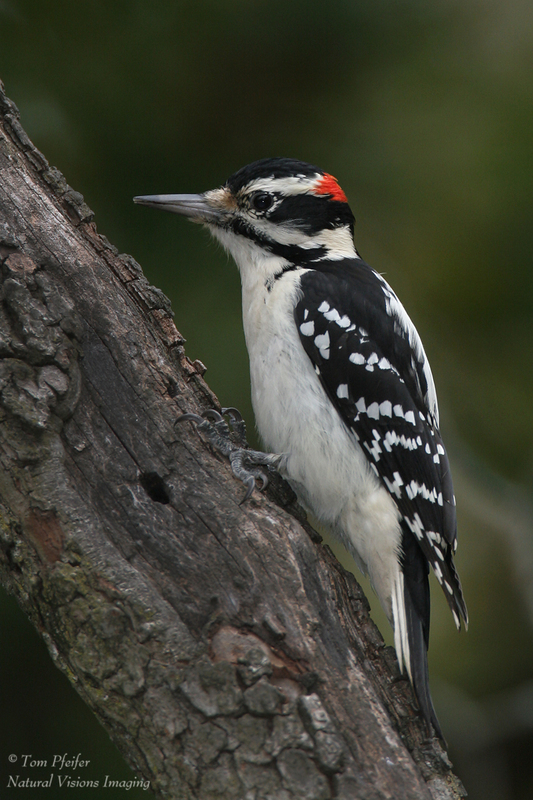 Hairy Woodpeckers are larger than Downy’s (about the size of a robin),have a much longer, more robust bill, and lack black dots on the outer tail feathers. Their harsh ‘pic’ call is also easy to distinguish from the downward whinny of the Downy. 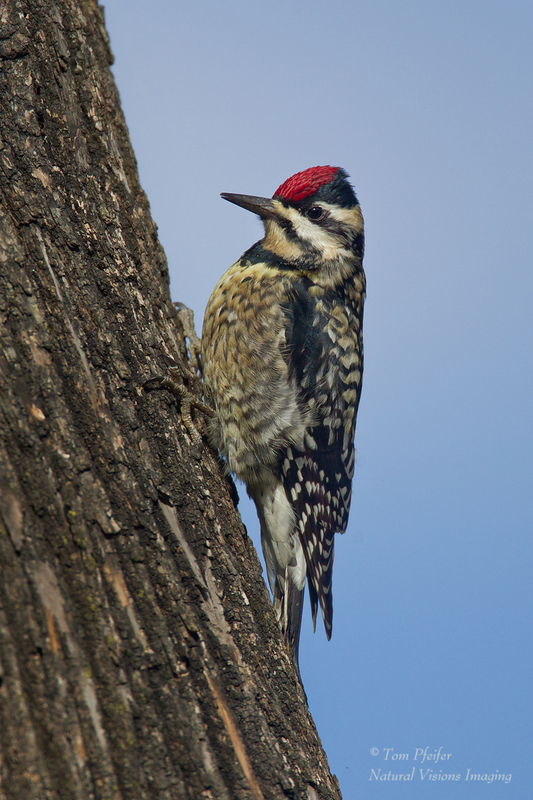 Hairy Woodpeckers generally require more extensive tracts than the Downy, preferring deeper, less open forests. 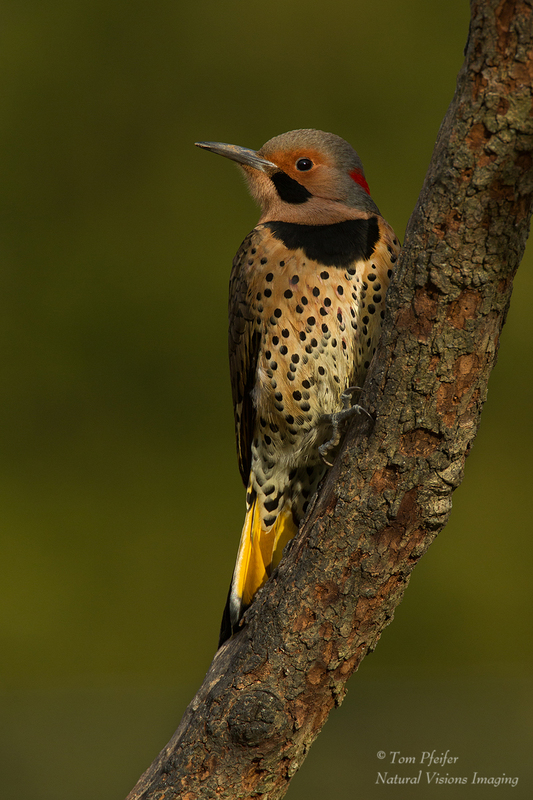 The Northern Flicker is another common woodpecker found on Long Island, both as a regular breeder and an abundant migrant. On good days during fall migration hundreds of flickers sometimes “magically” appear on the south shore barrier islands. The flicker is unique among our woodpeckers in that it actively feeds on the ground, usually in search of ants, its primary food source. Their reliance on ants, which disappear in winter, explains the highly migratory nature of the species. Increasingly common, the Red-bellied Woodpecker was unknown on Long Island a century ago. Since that time it has undergone a northern range expansion (it is now breeding in Vermont and Ontario) and has become a common breeding woodpecker throughout Long Island. Like the Downy Woodpecker, it frequents feeders. It’s hard to miss this conspicuous species as its distinctive rolling calls pierce the woodlands. It likely breeds in any medium- to large-sized forest tracts on the Island. This gorgeous and distinctive looking woodpecker species has undergone the greatest population decline of any of our native woodpeckers, a phenomenon first described in the mid-19th century. It is now an uncommon nester with only about a few nesting occurrences reported each year. The cause(s) of its decline are unclear, but competition with cavity nesting starlings and a reduction in “mast” trees (oaks and beeches which are key food sources) likely play a contributory role. It prefers more open habitats than the Red-bellied. This species doesn’t breed on Long Island, but is a regular migrant on Long Island, especially in the fall. It frequents open park-like settings with scattered trees. Evidence of its presence is the parallel rows of small holes (known as “wells”) the sapsucker makes in trees to lick up sap with its brushy tongue (along with an insect or two in the process). Downy Woodpecker: The common woodpecker of suburban Long Island. It is the smallest woodpecker (the size of a house sparrow), is widespread on Long Island, and often visits backyard bird feeders during the colder months. It does well in Long Island’s heavily developed communities since, in addition to larger tracts, it can successfully inhabit small woodland fragments of just a couple of acres in size. Hairy Woodpecker: A common woodpecker species on Long Island, but less abundant than its look-a-like cousin, the Downy Woodpecker. Hairy Woodpeckers are larger than Downy’s (about the size of a robin),have a much longer, more robust bill, and lack black dots on the outer tail feathers. Their harsh ‘pic’ call is also easy to distinguish from the downward whinny of the Downy. Hairy Woodpeckers generally require more extensive tracts than the Downy, preferring deeper, less open forests. Red-Bellied Woodpecker: Increasingly common, the Red-bellied Woodpecker was unknown on Long Island a century ago. Since that time it has undergone a northern range expansion (it is now breeding in Vermont and Ontario) and has become a common breeding woodpecker throughout Long Island. Like the Downy Woodpecker, it frequents feeders. It’s hard to miss this conspicuous species as its distinctive rolling calls pierce the woodlands. It likely breeds in any medium- to large-sized forest tracts on the Island. 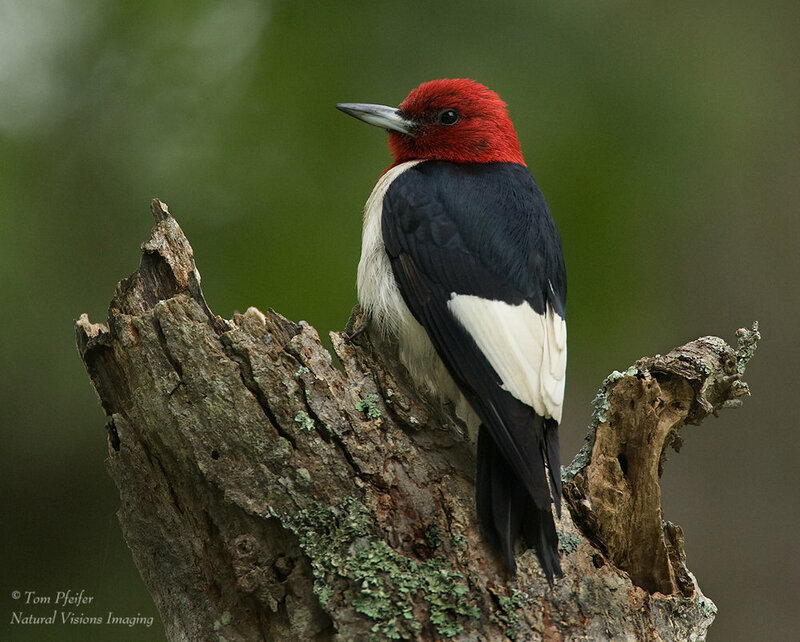 Red-headed Woodpecker: This gorgeous and distinctive looking woodpecker species has undergone the greatest population decline of any of our native woodpeckers, a phenomenon first described in the mid-19th century. It is now an uncommon nester with only about a few nesting occurrences reported each year. The cause(s) of its decline are unclear, but competition with cavity nesting starlings and a reduction in “mast” trees (oaks and beeches which are key food sources) likely play a contributory role. It prefers more open habitats than the Red-bellied. Northern Flicker: The Northern Flicker is another common woodpecker found on Long Island, both as a regular breeder and an abundant migrant. On good days during fall migration hundreds of flickers sometimes “magically” appear on the south shore barrier islands. The flicker is unique among our woodpeckers in that it actively feeds on the ground, usually in search of ants, its primary food source. Their reliance on ants, which disappear in winter, explains the highly migratory nature of the species. Yellow-bellied Sapsucker: This species doesn’t breed on Long Island, but is a regular migrant on Long Island, especially in the fall. It frequents open park-like settings with scattered trees. Evidence of its presence is the parallel rows of small holes (known as “wells”) the sapsucker makes in trees to lick up sap with its brushy tongue (along with an insect or two in the process). We conclude with the largest woodpecker found in the Northeast - the Pileated Woodpecker - a crow-sized species whose absence on Long Island is a bit of a mystery, since there are extensive tracts of mature forest which seem to provide suitable habitat. It is found in similar forests nearby in Westchester County and the lower Hudson Valley, as well as southern Connecticut and northern New Jersey. A few individuals were reported in the 1980’s but there has never been any definitive proof it has bred here or extensively used the forests on Long Island. An 1893 report states that a few Pileated woodpeckers were found in the forests of Brooklyn but the forest they were found in has long been destroyed. Perhaps, one day, it will begin to utilize the forests on Long Island and perhaps becomes a breeding bird.